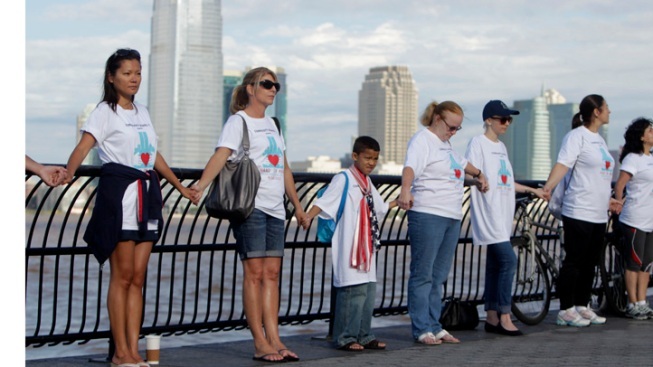 People join hands and observe a moment of silence during a remembrance of 9/11 in Lower Manhattan in New York, Saturday, Sept. 10, 2011. Hundreds of people have gathered in lower Manhattan to hold hands in remembrance of the Sept. 11 terrorist attacks. Families, teenagers, and others clasped hands as a bell clanged at 8:46 a.m. Saturday to signify the time the first of two hijacked planes crashed into the World Trade Center's North Tower. The group formed a straight line that snaked along the southern tip of Manhattan and through an exhibition of American flags, displayed to honor the dead. After a moment of silence, the group broke into applause. Some people cried. Others-- including strangers--hugged. Manhattan resident Dino Fusco brought his two daughters to the event. The 45-year-old father says it's important for them to pay their respects and to learn about the country's history, even when it's sad.